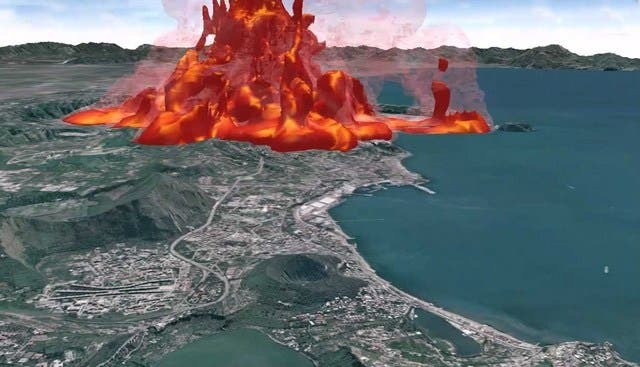 Campi Flegrei, "burning fields", is a supervolcano that consists of a vast and complex network of underground chambers that formed hundreds of thousands of years ago, stretching from the outskirts of Naples to underneath the Mediterranean Sea and last erupted in 1538. According o the BBC, about half a million people live in its seven-mile-long caldera, which was formed by vast eruptions 200,000, 39,000, 35,000 and 12,000 years ago. Recent events suggest that the monster is awakening: deformation and heating within the caldera saw the Italian government raise the volcano's threat level in December 2016. A study published in May 2017 found evidence that the supervolcano has been building towards an eruption for decades. Fears are growing, says the BBC, that magma deep inside Campi Flegrei could be reaching the "critical degassing pressure", where a sudden large-scale release of volcanic gases could abruptly inject heat into surrounding hydrothermal fluids and rocks. When this happens on a significant scale, it can cause catastrophic rock failure within the volcano, triggering an eruption. The volcano's most notorious supereruption was the Campanian Ignimbrite eruption, which occurred some 39,000 years ago when much of Europe was going through a lengthy glacial period. The consequences are thought to have created a volcanic winter that devastated much of the continent for centuries. It punched an estimated 300 cubic kilometres of molten rock 70km up into the stratosphere, along with an estimated 450,000 tons of sulphur dioxide. The ash cloud was carried as far as central Russia, some 2,000km away. The timing of this huge eruption is suspicious, because many archaeologists believe that 39,000 years ago is roughly when our cousins the Neanderthals died out in Europe. According to the BBC, it has long been speculated that the eruption triggered extreme environmental conditions across Europe, contributing to the extinction of the Neanderthals, at least in some regions.